William Burke and William Hare were vilified in 1828, and yet they were instrumental in advancing instruction in anatomy for generations of studies. Until 1832, schools of medicine and anatomy in England and Scotland were deficient in their major instructional tool: cadavers for dissection and anatomical instructional demonstrations. Notwithstanding Church protestations that an intact body was requisite to entering heaven, the Parliament enacted the Murder Act of 1751. Medical schools were allocated one body per year for purposes of dissection, with that body restricted to murderers who were condemned to execution and dissection. The supply remained grossly inadequate. In 1810, an Anatomy Society was established, with member anatomists, surgeons, and physiologists, virtually all of whom were of the upper social strata and wealthy. They proposed being given access to unclaimed cadavers of paupers from workhouses. The outcry from the poor prevailed, and the proposal was rejected. To meet the still-unfulfilled need, anatomists resorted to purchasing bodies from “resurrectionists,” without questioning their source. Body snatching became so common that family members routinely stood watch over the graves of loved ones after interment, with a watchful eye for gravediggers. Burke and Hare devised a simpler and more direct method of obtaining their cadavers. Operating in Edinburgh, they murdered sixteen individuals and sold their bodies to Dr. Robert Knox, a highly respected surgeon and anatomist, who was reported to be the most popular private lecturer of anatomy in that city. After being apprehended, Hare was given an opportunity “to turn King’s evidence” against his partner in murder and was granted immunity from prosecution. Burke was sentenced to hanging and dissection, and his skeleton is currently on display at the University of Edinburgh’s Anatomy Museum. In his confession, Burke swore that Knox was unaware of the source of the bodies, and, although never prosecuted, Knox’s prosperous career in Edinburgh unceremoniously ended. The notoriety associated with the murders led to the passage of the Anatomy Act of 1832, which enabled doctors, anatomy teachers, and medical students to obtain and study cadavers that were legally donated or authorized by government authorities. SEE ALSO: Leonardo’s Human Anatomy (1489), Vesalius’s De humani corporis fabrica (1543). 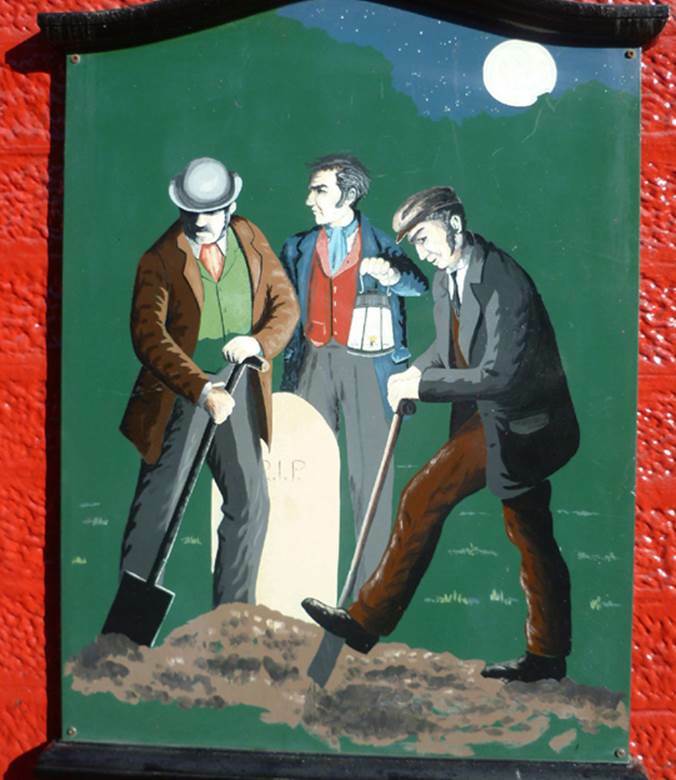 This painting of body snatchers hangs on the wall of the Old Crown Inn in Penicuik, Scotland—an inn that Burke and Hare allegedly frequented.